The Southern Environmental Law Center (SELC), Wild South, the Western North Carolina Alliance (WNCA) and the Southern Appalachian Forest Coalition (SAFC) announced last week that they had reached an agreement with the U.S. Forest Service to protect nearly 50 acres of old growth forest that had been included in a timber sale known as the Haystack project, in the Nantahala National Forest, near Franklin. The Nantahala Ranger District has agreed to abandon two sections of the sale that included trees 100 to 200 years old. Parts of the Haystack project include some of the same area that old growth researcher Rob Messick had delineated as the Topton Cluster back in 2000, while working with WNCA. According to Messick, old growth forest types in the Topton Cluster include dry oak, submesic oak, rich cove (mixed mesophytic), acidic cove, high elevation northern red oak, northern hardwood, and dry oak-pine. Only about 7.5 percent of the million or so acres of forest in the Nantahala and Pisgah National forests are old growth. 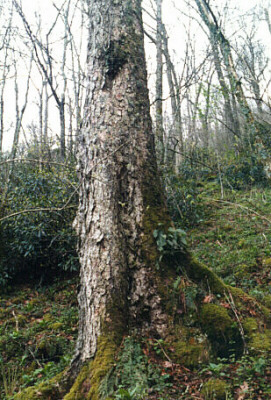 These old growth forests (from 100 foot-plus lush canopies, to the one to three acre forest gaps created when one of these behemoth falls, to standing dead snags and to the rich organic topsoil and woody debris created by hundreds of years of decomposition) create a unique and diverse ecosystem that can never be mimicked by younger forests. For those who follow the Naturalist’s Corner you know that I have been extolling the Forest Service for its move toward stewardship contracting, but have also warned that stewardship contracts must still be scrutinized. The best I can tell from Forest Service websites is that the Haystack project is a stewardship contract, although I haven’t been able to determine who the partners are. And at a glance of the project there appears to be a lot of good restoration work planned for the project.